Streetside view of Marina on a day with remarkably light traffic; somebody had died, and the markets had closed. 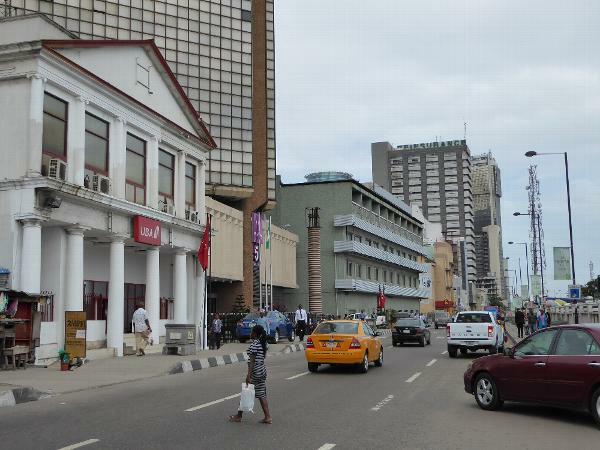 UBA, the United Bank for Africa, is in the building that once was Barclay's: the British royal arms used to occupy the framed rectangle in the pediment. Most of the other buildings are newish, but pretend that you see palms (originally, Eucalyptus) off to the right, on the space now backed up by the elevated freeway. The late Kaye Whiteman, a journalist with long experience of West Africa, writes, "When I first saw it in 1964 it [Marina] was still a pleasing street.... It faced directly on to the lagoon, looking over to the port in Apapa.... Yet the landfill that occurred in the lagoon alongside the Marina in order to build the overhead motorways from the late 1960s onwards destroyed the street's purpose.... The Marina ceased many years ago to be a promenade." See Kaye Whiteman, Lagos: A Cultural History, pp. 228-9.